When Do Water Hyacinths Bloom? Widely sold by nurseries for home aquatic gardens, the water hyacinth (Eichornia crassipes) has an exceptionally invasive characteristic. A native of South America, the plant has successfully naturalized around the world. Its invasive tendencies and its ability to rapidly reproduce threaten native plant life. The plant reproduces through flowering, which produces an abundant seed crop, and vegetatively. The water hyacinth floats across the water's surface. In areas with inclement weather, the water hyacinth produces flowers in the late summer and early fall months. In regions with year-round warm weather such as Florida, the plant blooms continuously. The water hyacinth floats freely across the surface of the water but can root into mud. It garners its nutrients from the water. It produces flowers that measure up to 3 inches wide. They appear in shades of purple, white and lavender. Each blossom boasts a single yellow spot that stands out in dramatic contrast. Once pollination occurs, the the flower withers and a seed pod begins to form. Each water hyacinth can produce up to 5,000 seeds. The seeds can remain viable for up to 20 years. Once the plant disperses its seeds, germination can begin in three days. The seeds can sink and remain dormant. Exceptionally tough seeds can undergo drought and flooding before germination. Wildlife often consumes the seeds and disperses them to new locations through elimination. 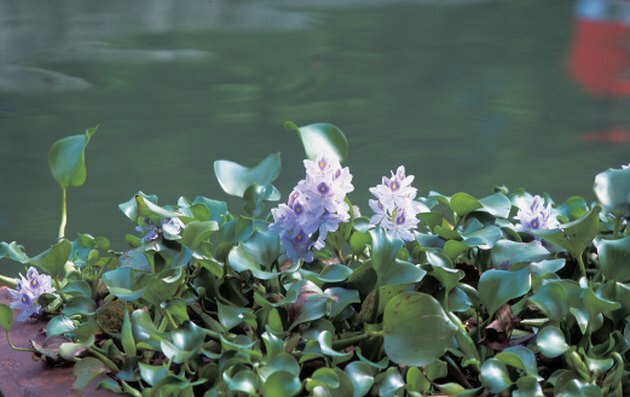 During the spring, the old stems of the water hyacinth will reproduce vegetatively and produce new plants. The plants grow in size throughout the spring and summer months to form a dense mat across the water's surface. The small plants begin to produce flowers in the late summer to reproduce through seed production, just as the parent plant did. The plant's ability to form mats allows it to quickly choke out native plants. The mats interfere with boat navigation and can impede irrigation. They also shade out the water and reduce the oxygen. A survivor, the water hyacinth has the ability to survive freezing temperatures once established. The use of aquatic herbicides that contain 2,4-D or diquat can effectively kill water hyacinth plants. Apply in the spring or early summer before the plant produces flowers and seeds to limit the plant's ability to spread. Harvesting the plants directly out of the water before flower production can also help control the plant's spread in small areas. Always dispose of harvested plants away from water.